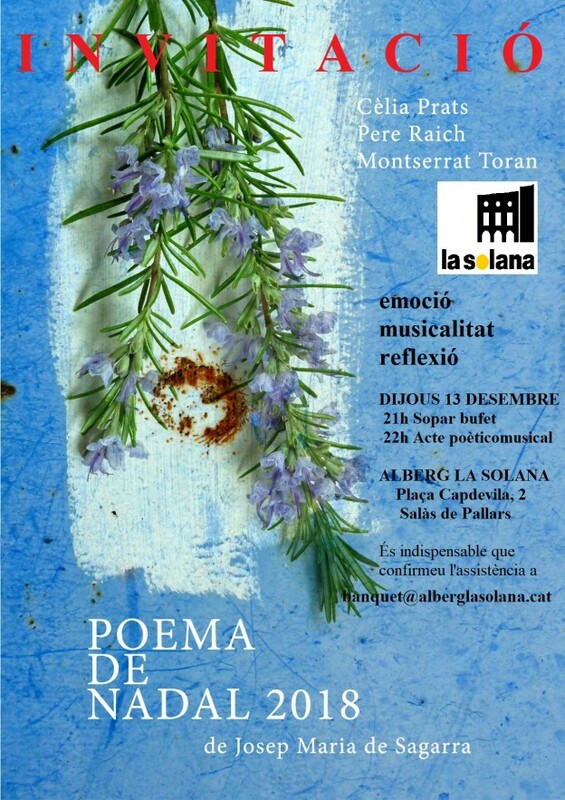 We celebrate the next Christmas holidays in a very special way: a poetic and musical act based on the POEM OF CHRISTMAS by Josep M. de Sagarra. Staging that alternates the inspired and reflective text of the teacher Sagarra with songs of tradition and Christmas experience. Celia Prats, Montserrat Toran and Pere Raich put all their talent at the service of some suggestive and formally impeccable verses that, framed by close and emotional sounds, will challenge us and move us. An intimate and direct dramatization, an experience of great sensitivity that should not be missed. We are waiting for you at the Albergue La Solana on Thursday, December 13, the day of Santa Lucia. We will start at 9 in the evening with a buffet dinner, and then we will immerse ourselves in the extraordinary poetic work. It is planned to finish a little before 11 o’clock at night. It is necessary to confirm the assistance with a message to the email banquet@alberglasolana.cat.